KLM is the flag carrier airline of the Netherlands headquartered in Amstelveen with its hub at nearby Amsterdam Airport Schiphol. The name KLM is an abbreviation of its full legal name, Koninklijke Luchtvaart Maatschappij N.V. (Royal Dutch Airlines). KLM operates scheduled passenger and cargo services to more than 130 destinations worldwide. 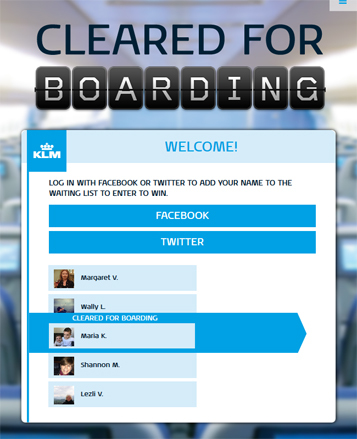 KLM wanted to lunch an app to manage “Cleared for Boarding” Promotion where prizes were to be given to users for connecting to KLM promotion site by using Facebook/Twitter logins and sharing this link with their friends. TechCompiler designed a responsive application for KLM where Users could connect using their social profiles and be contenders for the prize. The users who shared maximum number of links became eligible for a prize via lucky draw. Users share branded content (Facebook shares and Tweets) to unlock the prizes. A different cumulative number of shares/re-tweets are required for each prize. 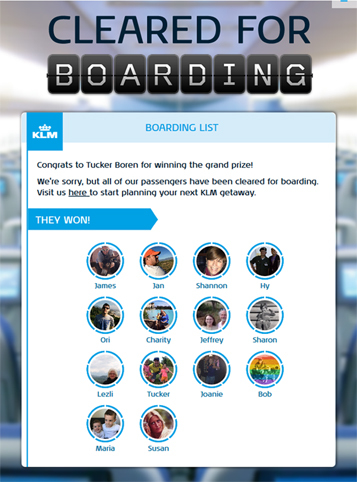 When the number of shares needed to unlock a prize is reached, the list stops and whoever is “cleared for boarding” wins the corresponding item.